1 Cup of frozen berries (Blueberries, mixed berries, raspberries) If doing strawberries, I would do freezer jam. Multiply by however many cups of berries you do. ie: 3 lb bag of berries, 6 cups of sugar. Start on low and stir often while you cook until it’s kind of liquidy and mixed together. Then increase heat to med/high and cook until thickened (about an hour?). 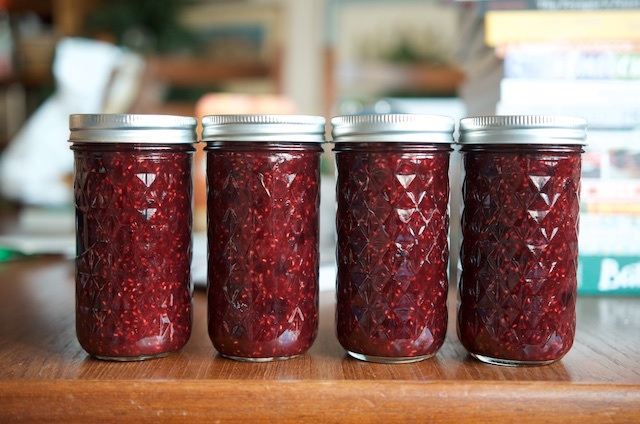 Pour in jars while it’s still kind of runny – before it gets too thick and gel like. It will be a little thicker than the consistency in the pan. Get jam jars at Target, Dans, anywhere really. Fill jars and then set lid on top. It will seal naturally because of the heat.